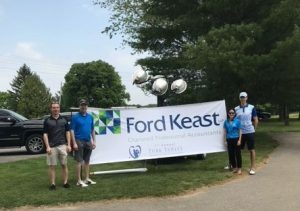 On Thursday June 7th, Ford Keast sponsored and participated in the 5th annual Turk Turley Memorial Golf Tournament. Ford Keast has been a proud sponsor since the tournaments inception which supports a great cause each year and holds great importance to one of our own team members. The tournament is organized by the Turley Family and Impressions Printing in St. Thomas. The proceeds of the tournament go to the St. Thomas Elgin General Hospital, with the specific sector changing each year. This year’s goal was to make a direct contribution to the Women and Children’s Department at STEGH, including pre-natal, intrapartum, post-partum, neonatal and pediatric care needs. In addition to the STEGH Foundation, four scholarships of $750 were granted to high school students in the community.